Two nights ago, I was given a beautiful dream. I am at a banquet, a gathering of soul-friends, when the speaker tells us the story of how, after the close of last month’s dinner, one of our group had died and been heroically brought back to life. I envision the dramatically unfolding scenario clearly, defibrillator paddles and all. I turn, amazed, to the woman seated next to me, who is the one who had died though she had spoken nothing of it. I ask her to tell me what it felt like. She answers, ‘I was in a basement, completely devoid of all light. Not a linear, ordered, predictable basement, like our dry walled ones, more like the meandering cellar of a catacomb. Groping in utter darkness, my hands flailed at the emptiness. I was losing consciousness, below consciousness. It was like drowning. My fingers were searching the wall for the opening, landing only on cold, damp stone. In my hand I held the plug end of an electric cord. I needed to find the outlet… the outlet… the receptacle into which it would fit. It felt like finding the proverbial needle in a haystack. I knew I was drowning, but I kept searching, methodically and desperately at once. Then, suddenly, I found it and it fit! At once, the room was flooded in light. Such is the way that a woman comes back to life. No tunnel of light she enters upon leaving, it is a flood of light upon her rebirth. I awoke with a start, knowing instantly that this was a big dream. No need to write this one down, I knew it was etched in my soul. I could feel viscerally in my body the losing-consciousness-feeling of drowning, the determined effort, the power of her coming alive. What does this mean? Am I too groping in the dark, buried in the catacombs, drowning? Have I lost consciousness, conscious living? When was the last time (a ‘month’ ago) that I sat at that particular banquet table, feasting on things of the spirit? Do I hold the plug right here in my hand that will flood me in light, bring me alive? Where is that place of fit for me? Am I coming alive?! 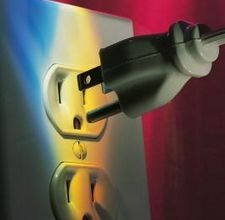 If I listen intently, diligently seeking, will I intuitively know where to fit the plug? Was the reading of yesterday’s book a clue, a place where a light has come on, giving me permission to choose what is a right fit for me? The word ‘outlet’ is curious to me. What else does outlet connote? A means of expression, of course, as in an outlet for creativity. A means of release or escape. In the case of the electrical outlet -a receptacle, a place of receiving. Again in the electrical outlet- a place where the masculine and feminine join, where being and doing are one. A place of great energy –ignition, passion, electricity and birth. As I drew this image in my journal—the electric cord and the outlet—the memory of inserting my arm into the root of Birtha came rushing back to me. When I plunged my arm into the root of that tree, a surge of energy coursed through my body. It felt electric! That was almost a month ago and I’ve been uncertain (or too timid to claim) what it meant for me. Somehow this all fits together, though clearly I am still in the dark. How is that a perfect fit? How am I to be a midwife, literally or metaphorically? Do my words or my companionship ease the passage for others? Am I being midwifed into being—these transformative waves of awareness pushing something new into life in me. Again I return to both/and, for always ‘the work’ does its work in both directions. The first book we read during our training (the woman in my dream was a teacher in that class) was Holy Listening, by Margaret Guenther. I recall that in it she refers to the sacred companion as midwife of the soul. The dream of the little hermitage in the woods – the cold mountain woman dream – has come back full force to me. A consistently recurring image for me now for almost 10 years, it rushed back into the light clearly last week when I gave myself permission to reclaim my own dream — a place in the woods that would offer shelter, salves for healing the broken, and nourishment for the renewal of the weary. Carved out and guarded, like the space that my own pain created for me all those years ago, it would be a private place for hearing and healing and seeing more clearly… not just for me but for others. That which we bless ultimately blesses in return. Might it not be a great place to create Beauty? Yes, your words and companionship do ease the passage for others.